Computers can be both durable and fragile machines at the same time. Sometimes, dropping one from the top of a building is not enough to even remotely damage it. Yet, a mere virus can permanently ruin the hard drive. The latter is the source of conflict in HoPiKo, where a virus called the Nanobytes infects video game consoles all over the world. As such, it’s time to save your HoPiKo brothers and save gaming itself. The actual game is an arcade-styled platformer with minimal controls and high-speed gameplay, with levels organized as 5 mini stages. Will gaming be saved or are the HoPiKos doomed forever? The game goes for a very simple take on what constitutes a platformer. There is no running or jumping, you just merely launch yourself from one platform to the next to reach the virus and smash into it. You can change the angle of your trajectory or just press a button to go straight at a right angle. That is merely it for the control scheme of the game. As the game focuses on high-speed action, gimmicks and getting the best time of a level, this is perfectly fine. There is enough variety in the actual obstacles that the simplicity never becomes an issue. There are also console-like collectibles that help to unlock the bonus stages. In regards to the game’s challenges, it mainly revolves around the inability to stay in one place for too long. This can range from platforms that explode, enemies that give chase, or the mere fact that all platforms can collapse from standing still for too long. All the while, you are expected to be precise in your launches with moving barriers, platforms, and Donkey Kong-styled launch barrels. For the most part, these are fair with a clear technical focus behind them all. However, there are times when the game gets far too strict, particularly when dangers such as a chasing laser wall or enemies pop up. The bonus stages in particular are very strict and require near perfect execution to succeed. Instead of merely launching from platform to platform, you have to ride a high speed vehicle that is exceptionally difficult to control while navigating barriers and mines. The problem is made worse with how you control yourself in the game. I played this game on the Switch with the Joy-Con so I’m unsure how it was on the Steam and Android versions. That said, while the simplicity isn’t the issue, the execution leaves much to desire. There are two ways to launch yourself, the touchpad or the joystick. For the touchpad, it’s based on where you initially pressed on the screen and not the player character’s position. Since the camera tends to pan in and out and shift a lot of the time, the touchpad leads to inaccurate launches. In regards to the joystick, it’s too easy for the game to register a different direction as soon as you try to launch yourself. 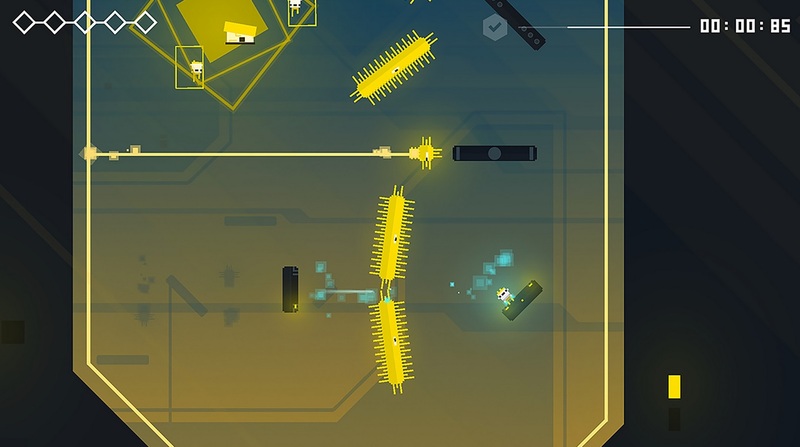 Combined with how at points you can die from seemingly nothing, the game becomes frustrating, especially since you have to start a run all over again. 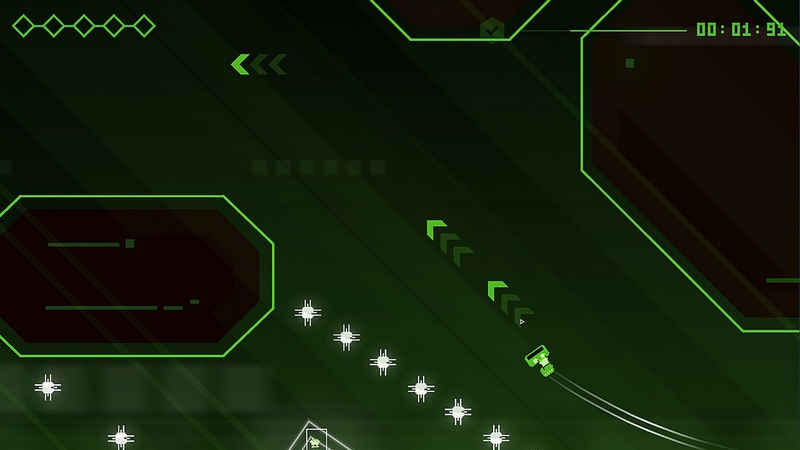 Overall, the problem stems from the lack of precision in a game about precision. Which is a shame since the game is designed well overall. The levels flow exceptionally well and most stages have reasonable expectations considering the difficulty of the game. Outside of random deaths, I have not experienced any major technical issues while playing. There are times that upon completing a stage, the completion screen will dim and not brighten up but that is merely it. From a fundamental design standpoint, the game works fine. It is the controls and random deaths that holds the game back majorly. As for presentation, the game is decent enough as well. While it doesn’t sound like it came from a Gameboy, the soundtrack of the game is quite decent. It just sounds like there are too many sound channels going on at once. Not to mention the soundtrack loops relatively quickly. 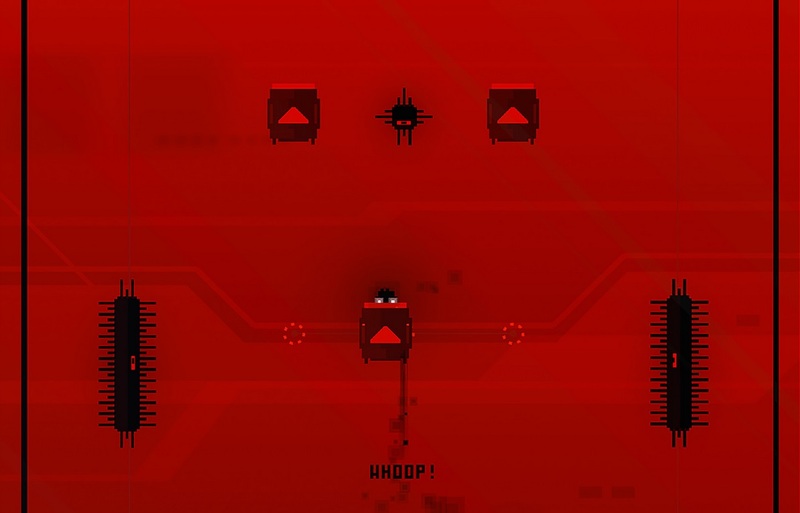 Visually, the game’s visual design lacks artistry, but allows the player to clearly see everything as best as they can. While there are times that it is too easy to confuse one platform for another, that is rare and tends to be in the dark-themed levels. Overall, HoPiKo is a game with well designed levels and mechanics but is held back by the controls, as far as the Switch version is concerned. If there was far more consistency in regards to going from platform to platform, then going by muscle memory would be viable. As it stands however, many times I felt like I got through a level by mere luck alone. If it weren’t for that, the game would be more along the lines of a 4/5. If the touchpad allowed the player to merely tap on where they wanted to go, then perhaps everything would’ve been more feasible on the Switch. With a standard price of $9.99 and multiple worlds with 11 levels each, combined with good replay value, it’s otherwise worth the price alone. As such, perhaps it might be best to look into the other versions to see how they handle before buying.